On Thursday, November 27, 2008 I had the pleasure of accompanying Roz Caldwell on a call to Shepherd, Texas. 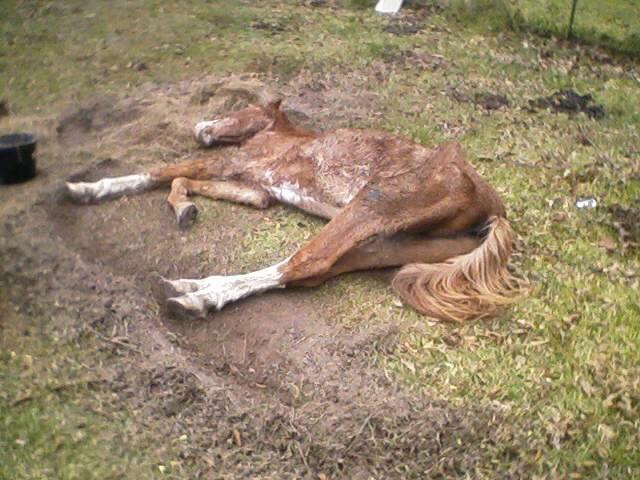 She had been contacted about a horse that was in great need of help. I hooked up my trailer and met her at Goodrich Post office and proceeded to the location. We met the local Deputy Sheriff, Officer Posey, at the location. 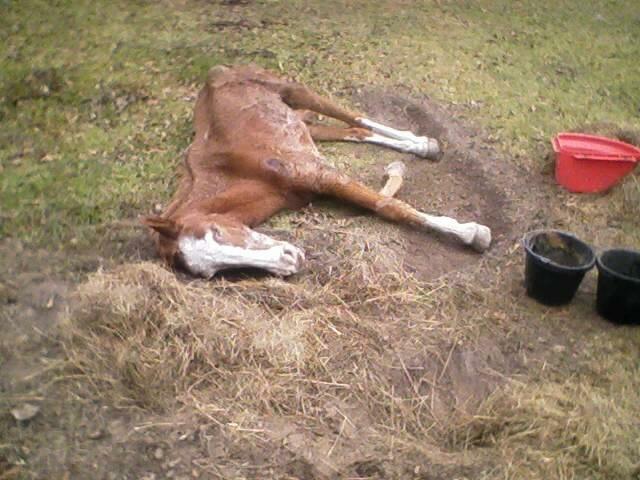 I looked out across the yard where the horse was laying on the ground out about 100 feet from the house. The sight just broke my heart, and yes, I broke down into tears at the sight. He was not tied but laying down, where he had been since the day before. He would try to get up, but could not. 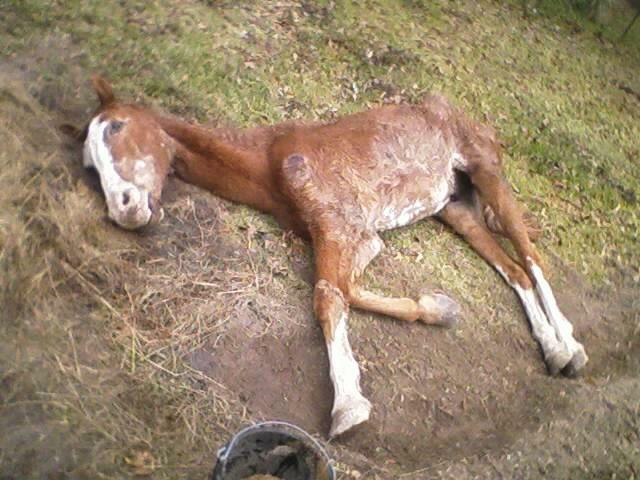 This horse was in such poor shape, he did not even have enough strength to stand. There were feces lying behind him where he evidently had defecated while laying there. It was black, as though no hay or grass had been ingested. Several times he tried to raise his head, neck and front legs to try to get up, but did not have the strength. We tried to locate a halter, (to try to get him) where upon we found dog food, all molded and damp, horse feed, all molded, damp and maggot infested, water was in at #3 tub with leaves in it and nasty looking. No halter to be found. We tried putting a rope around his boney, skinny neck to get him up but two women and a two Deputy Sheriff�s were just not strong enough. I am not even sure he would staid standing if we did get him up. Roz pulled out some hay and started feeding him the hay. He lay there on his side and ate the hay, as his head was laying on the ground, chewing as best he could, while I got hand full of water and dribble it on the hay to get him some water in his system. Eventually, another lady showed up with some feed and we fed him about a pint of food. I wet that as well. He was so starved that he could not eat the feed fast enough. We stayed with him for about 2 hours and finally realized there was not much else we could do. The Deputy Sheriff had called the Houston SPCA and they said they could not come and help with the situation. The Veterinarian in Coldspring was called but she could not come out until Saturday, November 29, 2008. On my way back from Houston with my twin sister, we swung by the house where the horse was located to find two Deputy Sheriff�s at the location. The owner was nowhere to be found. Word is she was there yesterday though. The horse was still down and looked to be breathing its last few breaths as we were there. The Sheriff department did get some assistance in turning the horse only to find huge sores on his shoulder and hind quarters where he had been laying since Wednesday. Please, if you see an animal in distress, not being taken care of, or starting to loose weight, PLEASE CALL someone in an authority position to get help. Animals depend on their caretaker to supply them with the essentials to stay healthy and strong. If you cannot afford to take care of an animal, please, give it up to someone who can. There is no need to torture an animal as this horse evidently has been by neglect. From what I understand, there were 3 dogs in the same condition as this horse. Editors note: According to Rita Bowen, the horse had to be put to sleep.